Studio Line: Columbia-Tristar - There Is No Gene For The Human Spirit. Box Office: Budget: $36 million. Opening Weekend: $4.32 million (1279 screens). Domestic Gross: $12.339 million. DVD: Widescreen 2.35:1/16x9; audio English Dolby Digital 5.1 & DTS 5.1; subtitles English, Spanish, French, Portuguese, Chinese, Korean, Thai; closed-captioned; single sided - double layered; 28 chapters; rated PG-13; 106 min. ; $27.96; street date 12/11/01. Folks tend to use the phrase "science fiction" in a fairly generic way that covers a myriad of genres. Action (Aliens), horror (Alien), fantasy (Star Wars), film noir (Blade Runner), comedy(Spaceballs), family drama (E.T.)... these movies have little in common other than the fact they're all considered to be science fiction. Action/fantasy-type films dominate the genre. Generally when the term "science fiction" is used, we think of Star Wars, Star Trek, or something else that deals with other worlds and adventures. Really, most science fiction movies spend their time dealing with the fiction, not the science. Gattaca offers an exception to that rule. Obviously it's fiction, since it takes place in an undefined but "not-too-distant" future. However, the movie's main focus deals with the ramifications of science, particularly in the area of genetic research. What if we get to the point where your baby can essentially be "made to order"? What if science could remove most of the uncertainties that come with reproduction? What would the world then be like? Those are the areas explored in Gattaca. To the film's credit, the ramifications of these possibilities are looked at calmly and rationally. Many films might take a Stepford Wives or Children of the Corn approach to the notion of a society into which babies can be genetically altered, but Gattaca avoids any overt attempts to shock. It tries to examine what the effects of these scientific advances might be upon those who aren't the best of the best. Really, the story told in Gattaca relates closely to any other "overcoming the odds" films such as Rudy or Simon Birch. The film's thesis essentially comes down to the tagline for the movie's ad campaign: "There is no gene for the human spirit." Unlike most films of the "triumph of the human spirit" ilk, however, Gattaca is really quite subtle. Yes, our hero has to overcome tremendous odds to achieve his goal, but the movie avoids melodrama and crass manipulation. I usually hate these kinds of "uplifting" films because they're so cheesy and obvious, and they're often quite sickeningly sugary sweet as they push you toward their artificially emotional climaxes. Gattaca doesn't do that. I did find it to be emotional and actually uplifting, but not in a phony way. It's a quite understated film, and it's surprisingly effective. One criticism leveled at Gattaca is its slow pace. Yes, the picture does proceed at a less-than-breakneck speed, but I didn't think it was too slow. Really, it's nice to see a film for once that doesn't feel it has to give the audience a big song and dance during every second of its running time; ideas and themes are given time to flow and evolve at their own pace. Another criticism revolves around its acting, primarily its lead. Ethan Hawke possesses some box office possibilities, but Olivier he ain't; Hawke's repertoire includes smirking and sneering and that's about it. Nonetheless, while he does little to elevate his role, he also does little to hurt it; he's a liability, but not a gross one. The supporting cast is really a top-notch group, but they do little to distinguish themselves in their roles as well. Alan Arkin is his usual fine self, and I always like to see Tony Shalhoub, but neither they nor most of the others stand out as terrific. The sole exception comes from Jude Law in his role as the bitter, selfish man whose persona Hawke's Vincent assumes. Law's really quite exceptional in what could have been a one-note role; his is the only fully-realized performance in the film. Despite the high quality of Gattaca, it completely failed to find an audience during its theatrical release in the fall of 1997. This probably shouldn't have been a surprise, since action fans would be disinterested in such a cerebral film, and those who go for more thoughtful fare may have been turned off by its sci-fi trappings. As seen in the DVD's supplemental materials, the ad campaign probably didn't help much either. Included on the Gattaca DVD is its trailer. It does a fairly poor job of communicating the nature and content of the film. Watching it, you're not sure just what to make of the movie, but it's rapid-fire editing and breathless music certainly make the film look more like an action flick than it is. Unfortunately, it makes the movie look like a rather bad action flick, so it's no surprise the crowds stayed home for this one. Unfortunately, this meant that Gattaca didn't reach much of a crowd, and that's a shame. While not flawless, the movie seems very moving and compelling, and it features a generally low-key take that is very refreshing. It gets its emotions naturally, and does little to force them. Gattaca offers a compelling and provocative experience. 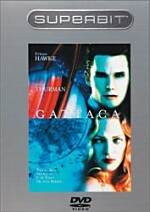 Gattaca appears in an aspect ratio of approximately 2.35:1 on this single-sided, dual-layered DVD; the image has been enhanced for 16X9 televisions. This disc represents the second DVD release of Gattaca. The original came out more than three years ago, back when the format remained relatively young. It crammed both fullscreen and widescreen versions of the movie onto one double-sided disc, but somehow it still managed to offer very satisfying picture and sound. However, apparently the good folks at Columbia-Tristar (CTS) thought they could improve upon this presentation. As such, Gattaca - as well as some other films - has been reissued as part of their �Superbit� collection. According to the booklet that accompanied the DVD, this line offers �the highest standard for picture and sound available on DVD� with �higher bit rate for better picture resolution than standard DVD�. Those are some lofty goals - will the DVDs reach them? After all, Gattaca already looked very good. I recently rewatched it in preparation for this review, and I thought that though it�s not one of the absolute best, the original remains very solid. Ultimately, I thought the Superbit release did provide a stronger viewing experience, but only to a slight degree. Sharpness appeared consistently solid. Throughout the movie, it remained distinct and accurate. I detected no significant signs of softness as the film always came across as crisp and well delineated. Jagged edges and moir� effects caused no concerns, and I detected no signs of edge enhancement. Print flaws were minor. Some light grain cropped up at times, and I also saw occasional examples of grit and speckles, but these were not large issues. The original Gattaca DVD featured some minor digital artifacts, but these seem to be largely gone from the new edition. Gattaca featured an intentionally limited palette that fit with the sterile depiction of the future. As such, colors looked clear and appropriately saturated, but they weren�t terribly vivid or attractive. Nonetheless, they seemed to replicate the filmmakers� intentions, and they showed good accuracy with no problems related to noise, bleeding, or other issues. Black levels seemed fairly deep and rich, while shadow detail was reasonably clean and visible; low-light situations appeared slightly muddy at times, but they generally came across well. Overall, the picture of Gattaca presented a positive experience. Also good but not stunning were the Dolby Digital 5.1 and DTS 5.1 soundtracks of Gattaca. Since the movie wasn�t exactly an action spectacular, most of the mix worked in fairly subtle ways, but it did so effectively. Music came nicely from all five speakers so that the score warmly enveloped the environment, and some solid usage of directional dialogue occurred as well. Many of the effects tended toward general ambience, but these added a lot to the experience, and the track came to life more actively when appropriate. My only complaint stemmed from the fact that some elements didn�t pan especially well. Note the movement of the cars during the sequence when Vincent crosses the street; they tended to transition fairly abruptly. Nonetheless, the soundfield seemed good for the most part. Although I'd heard some modest differences between the Dolby Digital 5.1 and DTS 5.1 soundtracks of prior Superbit title Air Force One, I heard no variances for (The Fifth Element or Gattaca. To these ears, the two tracks sounded identical. They also seemed the same as the Dolby Digital 5.1 mix found on the original Gattaca DVD. As for picture differences, they do exist, mainly because the Superbit version eliminated some minor digital artifacts. However, since parts of Gattaca still maintain a moderately grainy look even on the new DVD, this change isn't terribly substantial. Yes, the Superbit edition looks better than the original, but the improvement wasn't enough to warrant a change in my "B+" grade. The original DVD of Gattaca offered only a smattering of extras. We got some deleted scenes, a promotional "documentary", some still photos and posters, a trailer, and text production notes. It wasn�t a great package, but it sure beat the Superbit release, which included absolutely nothing. This came as no surprise, since the Superbit discs go for movie-based purity. They tout themselves as devoting all their space to the film itself and leave off the various gewgaws. There wasn�t much to omit in this case, but it�s gone nonetheless. I do find the omission of the original production notes to seem odd, however; since when did a paper insert affect the bit rate of a DVD? However, CTS promised an absolutely bare-bones effort, so I can�t gripe too much, despite this bizarre aspect of the package. Note that the Superbit Gattaca also lacks any kind of interesting animation or pictures in its menus. Frankly, this seemed weird as well. The original disc just had a still photo as the main menu�s backdrop; would it have taken all that much disc space to include it again? And was there not room enough to list little text identifiers for the various chapters in the �Scene Selections� menu? Whereas the old one provided some minor comments, this one just lists numbers. Granted, the DVD�s insert card provides descriptions, but these would be much more convenient on the disc itself. They still found the room for animated CTS and Superbit introductions at the start of the disc, and the DTS trailer also appears, so it�s not like this DVD dropped all of these sorts of things. As a film, Gattaca offers a moving and intriguing experience. It delves more into ideas than action, which makes it unusual in this day and age, and it works quite well. As a DVD, this new �Superbit� release provided largely the same fine picture and sound found on the original disc. The image cleaned up some small digital artifacts, but otherwise, I detected no substantial differences between the picture and audio of the two packages. It totally lacked any extras and it did not seem to improve significantly upon the old edition. In my opinion, the prior DVD of Gattaca looked and sounded identical to this one for the most part, plus it tossed in a few extras that the Superbit disc dropped. With a list price that�s eight dollars lower, anyone who doesn�t own Gattaca but wants it should go for the original disc. Those who already have the old one should keep it and spend the money elsewhere; the new �Superbit� version of Gattaca doesn�t merit an upgrade.